A question that comes up often with people investigating entering the sport of kayak fishing is “How do I get my kayak to the beach”? The answer can vary depending on your vehicle, the length and model of your kayak, the number of kayaks you want to carry and your physical ability to lift your kayak overhead. Thankfully there are several rack manufactures that can address any situation you will run into. One of the top rack manufactures that you will want to look into for your kayak carrying solutions is Yakima. For those driving a vehicle that has a factory roof rack, the solution can be as simple as putting the kayak upside down on that rack and securing with quality tie down straps with cam buckles. I mention these straps because I have seen way to many people either struggling with ropes and bungees or using straps with ratchets that can cause damage to your kayak or rack because they can be easily over tightened. When you secure your kayak the straps should be snug but not cranked down to the point of distorting the hull of your kayak. Particularly for longer trips an added bow and stern line can be added as extra insurance against a fly away kayak. If your vehicle does not have a roof rack, the rack you have is not rated for the weight of your kayaks, is too low to carry your kayak upside down or, as is the case on many factory racks, is too narrow to carry more than one kayak you will want to add a cross bar rack system. The nice thing about these rack systems is that you can add accessory mounts so you can carry not only your kayaks but add bikes carriers, luggage pods and more. You can also add saddles, for carrying your kayaks upright, which is more common with glass kayaks, or kayak stackers which allow you to carry your kayaks on edge so that you can carry more kayaks on the rack. I often hear from people that what is keeping them from getting a kayak is their inability to lift the kayak onto the roof of their car. Thankfully this problem has been addressed by most of the rack manufacturers. Solutions like the Showboat from Yakima allow even the smallest person to load their kayak single handedly. The Showboat is an ingenious boat load-assist roller which slides out over the rear of the vehicle for easier access and vehicle protection. With this system you need only lift one end of the kayak at a time, propping one end on the roller then simply sliding the kayak into position on the rack. These assist type of racks will add a little cost to rack system but if it gets you using your kayak and not dreading the loading and unloading process it is worth it. If you are like me a truck is your kayak carrier of choice and thankfully there are many choices for kayak carriers for us truck lovers. For the person that only has one or two 10 foot kayaks, it can be as simple as tossing the kayak in the bed of the truck. The problem arises when we get into shorter bed trucks and longer kayaks. For instance my kayak is just shy of sixteen feet but the bed of my truck is 8 feet, which is a lot of overhang. A great solution for this can be found at Yakima with either The Dry Dock, a rack that slips into the hitch receiver on your truck or the Outdoorsman. This easily-installed truck rack system clamps onto truck bed rails without any drilling and gives you an above bed rack keeping the bed clear for other gear. Because I do have to carry multiple kayaks and a lot of gear in the bed of my truck this is the system I prefer. You can add accessory attachments to the cross bars to carry multiple kayaks as is the case on my truck or other items like bikes or cargo pods. As a side note I also have a spray in liner in my truck to keep rust at bay. I have also added a false bed to my truck so I can slide my rods and paddles underneath and pile my other gear into the bed. The last solution to kayak transport I will touch on briefly is trailers. 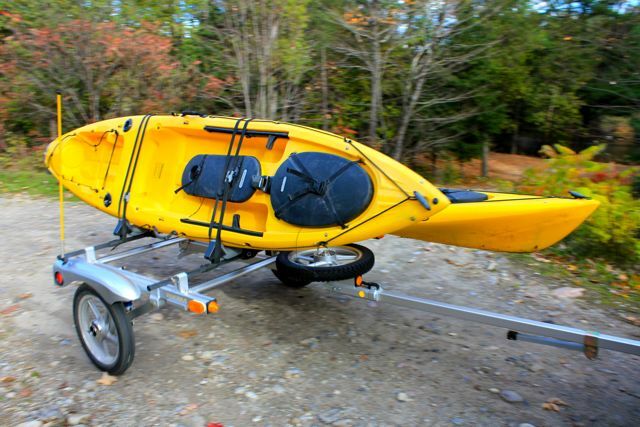 Trailers can be an excellent way to carry your kayak and gear. The positives being the ability to keep your kayak fully rigged on the trailer ready to go, no overhead lifting, the ability to carry multiple kayaks without needing a truck to do it. The negatives would be, the need to register the trailer, having to deal with wiring the trailer lights with your tow vehicle and the tight parking situations we run into at the beach. For many people the positives far outweigh the negatives and you can find some very nice kayak trailers premade by Yakima. They do come at a premium price starting at $1900 and going up as you add accessories. This is quite a bit more than the other rack solutions mentioned in this article, but they are light enough to be pulled by a small vehicle, equipped with a trailer hitch, and can easily carry multiple kayaks with the right accessories added. The trailers are prewired and easy to tear down for storage if you don’t want to leave it rigged up and as mentioned before no more overhead lifting of your kayaks. Here are a couple tips on strapping down your kayak. Loop the strap around the cross-bar of the rack then bring both ends over the kayak and loop around the cross-bar on the other side and cinch down snuggly. The idea here is to pull the kayak straight down onto the rack. The strap should not be wrapped completely around the kayak this will make it tougher to get a snug fit on the rack, and you should never run the straps through the scupper holes of the kayak, this can damage the most vulnerable part of your boat. Replace your straps when they get any nicks or frays in them, begin to feel dried out or when the buckles stop functioning properly. Strap failure could do much worse than destroy your kayak, flying off your roof while running down the freeway could cause a serious problem for the person driving behind you, and you would be responsible. When making long trips, particularly when running down rough roads, make a habit if stopping periodically and checking to be sure your straps have not loosened up. I hope this gives you some ideas on the different options from transporting your kayak. I am sure one of your local kayak dealers can help you much more in getting the right rack for your needs.